A bombing at Cairo’s largest Coptic cathedral has killed at least 25 people and wounded nearly 50 others. Most of the victims are reported to have been women and children. The explosion took place during a packed Sunday morning mass in a chapel adjourning St Mark’s. The cathedral is the main headquarters of Coptic Christians in Egypt and home to the head of the church, Pope Tawadros II. For the moment, no group has claimed responsibility for the attack, but suspicion is likely to fall on Islamist extremists who have attacked Egypt’s ethnic Coptic minority in the past. There are around 9 million Coptic Christians in Egypt – around 10 percent of the population. ‘‘Treason and terrorism is affecting the whole country. It is hitting both Muslims and Christians, regardless of whether the place is a church or not. 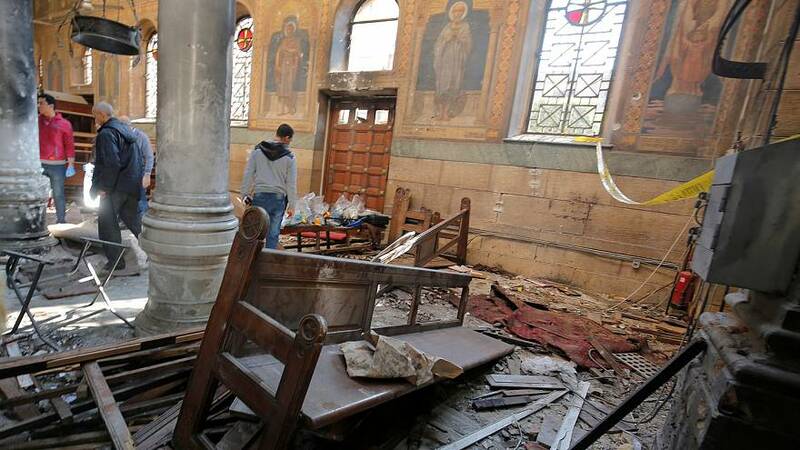 We pray that this can be de-rooted and everyone can live in peace,’‘ one Coptic bishop said. Egypt’s President Abdul Fattah al-Sisi has condemned the attack declaring three days of national mourning. Later on Sunday, several hundred Coptic Christians gathered to protest outside the Cathedral. The latest violence follows two roadside bombs on Friday – one in Cairo, the other north of the capital. That saw six police officers killed and another six wounded. Egypt is currently fighting a branch of ISIL in Northern Sinai, where hundreds of soldiers and police have been killed. ISIL fighters have launched several deadly attacks in Cairo and other cities.